When announcing details of his last limited release, Mornington's head brewer promised they'd be ramping up to their former frequency now that the installation of a new brewery is complete. And true to his word, here's another. It's one that's inspired by a few styles he's spied in the US, one that uses oatmeal – an ingredient more commonly found in darker beers such as stouts – within a pale. He tells us: "This is a style that a few breweries in the US are starting to brew so l thought I’d give it a go. 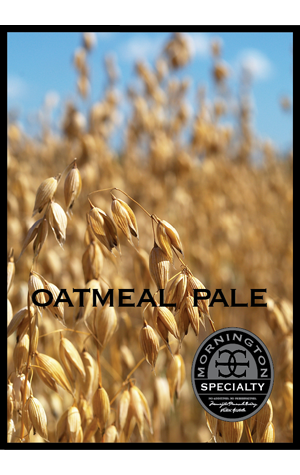 With all the oats the beer presents wonderfully with a beautiful snow-white head of foam. It’s a lovely crisp and refreshing pale ale with citrus and pine aromas and a lovely balanced palate where the hop flavours run the length of the palate – more pine with passionfruit and a hint of honey in support." He says they're already getting some "really great feedback" so go hunt it down and see if you agree.